Posted on May 12, 2015 . 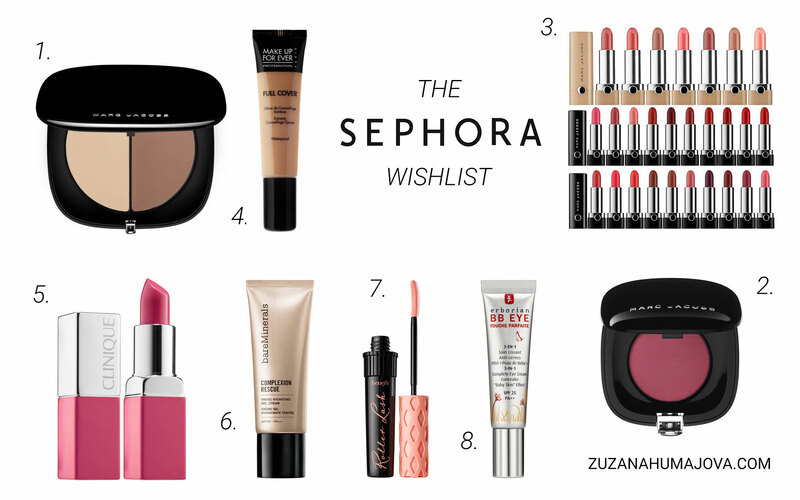 I’ve realised that I’ve never posted a beauty wish list on my blog! Not that I don’t have multiple of them in my notes. But as I’m planning our summer holiday abroad right now I think it’s the perfect time to do one. So I decided to put together a list of products I would love to check out in person during our Italian road trip and many Sephora visits. The main thing I want to try out is the Marc Jacobs Beauty range which is not available nowhere near. Through swatches I fell in love with the 1. Marc Jacobs Instamarc Contour Powder. ‘Mirage Filter’ looks like a perfect shade for contouring fair to medium skin tone. I’ve also read multiple raving reviews of 2. Marc Jacobs Shameless Blushes and 3. Marc Jacobs Le Marc lipsticks. Can we stop for a second and look at that gorgeous sleek black packaging? I can’t leave without at least one piece. 4. Make Up For Ever Full Cover concealer is something I wanted to try for ages. Who doesn’t want a creamy concealer that covers everything? I definitely do. Another lipstick I want to look at in person are 5. Clinique Lip Pop lipsticks. I’ve heard they are a dream to apply and the finish is beautiful. Can’t wait to swatch’em all. The only newly released base that caught my attention is 6. BareMinerals Complexion Rescue. Even though I have combination skin, it’s also sensitive so I prefer the more moisturising bases instead of mattes. Plus SPF 30 is perfect for this time of the year and the shade range is great. I usually hate Benefit’s marketing strategy and I always wait for quite a long time before purchasing a new product from them. But I LOVE They’re Real mascara and this new curling version looks so good too! Plus I really need a new non-waterproof mascara so I think I have to give 7. Benefit Roller Lash a go. The last thing I really need want to try is the 8. Erborian BB Eye cream. Their BB cream light is still one of my most loved and used base products so I’m rather intrigued by this under eye concealer version. Have you tried any of these products? What’s currently on your whishlist?